The prevailing narrative about Buddy Hield is that not only is he having an incredible season for the Sooners, but that his success is another shot fired in the 21st century basketball revolution and he should be drafted as such. Earlier this year, Hield was a late lottery to mid-first round pick. Now, people can’t contain their Buddy excitement. Information like this tweet from ESPN NBA Draft expert Chad Ford suggests the NBA GMs may agree. But does Buddy’s magic season signal what’s ahead for his time in the NBA? He wouldn’t be the first great college player to fail at the next level. Let’s examine what he’s done in his time at Oklahoma and project how his skills and weaknesses will translate to the next level. Hield has undoubtedly proved himself able to hit open shots and create shooting opportunities for himself beyond the arc or in the mid-range via a step-back move or, less frequently, as the ball-handler in a pick and roll. He has done all of this against high-level college defense, though most, if not all of it, should continue against better defenders in the NBA. The Pro-Buddy camp would hope that as the people defending him getting bigger, faster, and stronger, so too does Buddy, as well as developing a move or two other than the step-back (which he’s grown very reliant on). You’d think there will always be a spot in the NBA as a shooter after his 25.4 points per game and 46.5 percent three-point shooting season, but Adam Morrison scored 28.1 points per game and shot 42.8 percent beyond the arc. And he only played 160 NBA games and now owns an apocalypse bunker. In order for Buddy to make an meaningful impact in the NBA, he’ll need to do more than shoot. Hield has had limited success driving to the basket this season. Many of his baskets around the rim come from backdoor cuts or on quick drives when defenders overplay him on the wing. As long as he continues to shoot this well, those opportunities won’t go anywhere. When the defense, both on him and around the rim, jumps up a notch, he’ll need to prove himself able to score in other ways. 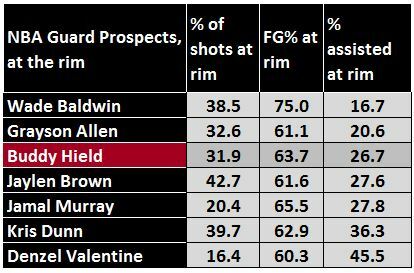 Hield’s numbers are middle-of-the-road among that group for the most part. His number of attempts at the rim and percent of assisted buckets are a tad on the lower end, but really for a guy perceived as just a shooter, those numbers are reassuring. 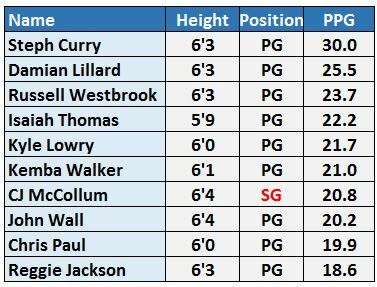 Only CJ McCollum averages 17+ without handling the ball, and he’s much more capable of doing so than Hield, but doesn’t need to with Lillard next to him. Obviously Hield can be successful while scoring less than 17 per game, but then he becomes a different sort of prospect. Players like JJ Redick and Lou Williams score in the mid-teens but are far from their team’s first option and aren’t the type of player teams look for in the top 5. I know, I know. 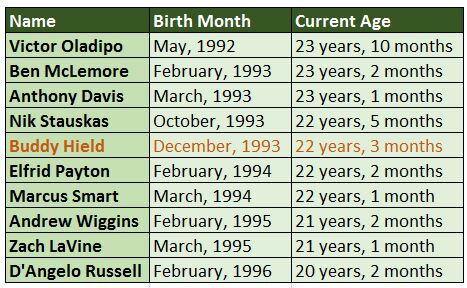 I keep harping on player’s ages in the draft process. I wrote a whole post about it a few months ago. But in Buddy’s case, it’s incredibly important. If he is going to develop into something more than an outside shooter, he’s going to have to do so quickly. He’s already 22 years old, right around the age of several notable players. This trade deadline, Ben McLemore was shopped around, to little interest. Back in 2012-2103, he and Buddy Hield were both freshman in the Big XII. McLemore scored 15.9 points and grabbed 5.2 rebounds per game, shooting 42 percent from beyond the arc. Hield posted 7.8 points and 4.2 rebounds per game, shooting a DISMAL 23.8 percent from outside. Clearly Hield’s game has grown in college since then, while McLemore has been an afterthought in Sacramento. What if McLemore was a senior at KU? What if Andrew Wiggins was playing beside him? What if Marcus Smart, Nike Stauskas, or D’Angelo Russell were still at their respective schools? And God help us, Anthony Davis as a senior is a scary thought. Is Buddy still the presumptive National Player of the Year in each of these cases? Or what if we flip it, and send buddy to the NBA three years ago to bob back and forth from the D-League and struggle to find his shot. Do we ever learn the name Buddy Hield then? Hypotheticals aren’t going to solve anything, but his and how he’s developed can’t be ignored. For Buddy Hield to be worthy of a very high draft choice, he’ll need to adjust his game, sooner rather than later. Hield’s defense has been a bit of a shrug this season. He’s been adequate. Not a liability, nor someone expected to stop the other team’s best perimeter scorers. In fact, this Saturday will prove one of his toughest tests, as he’ll spend plenty of time guarding Josh Hart and Ryan Arcidiacono, both potential NBA players. Though I won’t publish my draft board until June, I can pretty confidently say I don’t expect to see Hield in the top 7. At his age and size, the ceiling doesn’t extend very high, even if the floor is also fairly high. He’ll become something between a CJ McCollum or Bradley Beal type and a Lou Williams or Jamal Crawford bench scorer, with a JJ Redick-esque career the likely landing point. I doubt he becomes the focal point of any NBA offense, which puts his top 5 draft status into question. With teams eager to find shooting and a below average draft class, he won’t fall much further than that, with Minnesota, New Orleans, and Sacramento all potential landing spots in the 5 to 7 range.